← Introducing True Scale Miniatures! 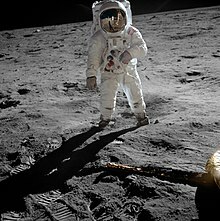 Aldrin walks on the surface of the Moon during Apollo 11. Aldrin was selected as part of the third group of NASA astronauts in October 1963. Test pilot experience was no longer a requirement, so this was the first selection that he was eligible for. After the deaths of the original Gemini 9 prime crew, Elliot See and Charles Bassett, Aldrin was promoted with Jim Lovell to back-up crew for the mission. The main objective of the revised mission (Gemini 9A) was to rendezvous and dock with a target vehicle, but when this failed, Aldrin improvised an effective exercise for the craft to rendezvous with a coordinate in space. He was confirmed as pilot on Gemini 12, the last Gemini mission and the last chance to prove methods for EVA. Aldrin set a record for extra-vehicular activity and proved that astronauts could work outside spacecraft. This entry was posted in Airplane Models, Hobbies and Toys, NASA Spacecraft Models and tagged Apollo Capsule, Buzz Adrin, Collectibles, desktop models mahogany models, Hobbies and Toys, military models, NASA, NASA Spacecraft, space shuttle. Bookmark the permalink. Thank you for the comment. Sign Up for our Newsletter and receive 5% Off your first purchase. Go to http://www.magellanmodels.com/About-Us-4.html to receive your coupon code.